HEEDING the call to give Jimmy Alapag a fitting curtain call in the PBA, Commissioner Chito Salud on Friday has included the recently retired Gilas Pilipinas captain a spot in the coming All-Star Game as the '13th man' of the South team. The special All-Star appearance will serve as the farewell game of Alapag, a former league MVP who announced his retirement on January 9 after Talk 'N Text's semifinal exit from the PBA Philippine Cup. On Thursday, Spin.ph ran a story about longtime teammate Asi Taulava expressing his wish to see the 37-year-old play one final game in the midseason extravaganza set in Puerto Princesa, Palawan on March 8. Since Alapag's name was no longer included in the All-Star ballots after he announced his retirement and therefore could no longer be voted in by fans, Salud decided to give him an automatic place in the South team. The set-up is ideal since Alapag will be given the chance to appear in the game without bumping off a deserving all-Star. “We can no longer include him in the balloting (which ends on February 11), but he’s the 13th man,” Salud told Spin.ph on Friday, confirming Alapag's place in the showcase. The league chief sees no technicality being broken in the set-up since the newly named Talk 'N Text team manager played in the last Philippine Cup, the first conference of the current season. PBA media bureau chief Willie Marcial said the league did not think twice to give the respect due Alapag, who helped Talk 'N Text win five championships since he was picked 10th overall in the 2003 rookie draft. “This is one great way of giving back to Jimmy for all of the contributions he has given to the league in his 12 years he played here,” said Marcial. Marcial also bared that a retirement ceremony the MVP group had planned for Alapag on February 15 has been cancelled. The many-time national player will instead be honored in the Puerto Princesa All-Star game. “It has been agreed upon by the league and the management of Talk 'N Text,” he said. To make the ceremony even sweeter for Alapag, former PBA vice chairman JB Baylon has declared that they will open the gates of the Puerto Princesa City Coliseum free of charge to the public for the All-Star game. This will mark the first time in PBA All Stars history that tickets to the annual festivity will be given out for free, as event sponsors Rio Tuba Nickel Mining Corporation and Coral Bay Nickel Corporation decided to shoulder all of the expenses for the All Stars. “This is for Jimmy, this is for the fans of the PBA,” said Baylon, now the vice president for corporate affairs of NickelAsia. “We are so proud to have supported an All-Star event where a PBA legend and future Hall of Famer will say goodbye to the league,” said the former team manager of Powerade Team Pilipinas, where Alapag also played.Alapag, meanwhile, has ruled out any comebacks. “No, there’ll be no Michael Jordan comeback for me. I am proud of the twelve years (I played) and feel blessed to had that long of a career in the PBA. 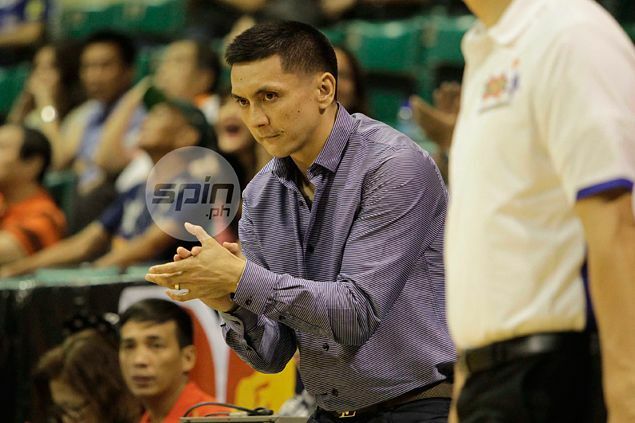 I now look forward to this new challenge moving forward,” said Alapag. “I got a growing family, I got two young kids. And having a new role as Talk 'N Text team manager and at the same time having the opportunity to help Gilas makes me excited at my new challenge,” he said.